Advance CS7000 Sweeper/Scrubber Rental - Bortek Industries, Inc. The CS7000 replaces power-hungry, high-maintenance hydraulic systems with efficient Electric Drive technology. 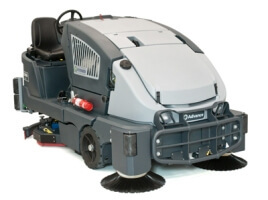 It cleans with a cylindrical sweeping system and a separate disc scrubbing system. The Advance CS7000 is the Industry’s first Hybrid and ePower™ Drive Combination Sweeper–Scrubbers that slashes your total cost of ownership. The new green class of industrial cleaning technology has arrived. The Advance CS7000 Combination Sweeper–Scrubber reduces total cost of ownership — including operation, labor and maintenance, while effectively doubling fuel economy and run-time efficiency. Now the most economical solution is also the most ecological. PLEASE NOTE, image on this listing is a stock photo. Actual photos will be uploaded when they’re available.